Your cost $1005.38 plus $350.00 Core Deposit Plus S&H. Remanufactured rebuilt NP243C Transfer cases with all new bearings, gaskets, seals and chain. Please supply Assembly Number at time of the order to ensure direct drop in replacement. 12 Month Unlimited Mileage NO Hassel Warranty! 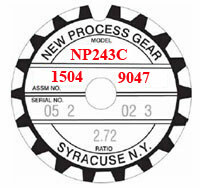 Want to repair your NP243C and need parts we can help and save money!